My tattered copy of the Bedtime Story. Notice the surreal cover. A clockwork mouse and a real mouse enjoying tea. I grew up on a daily diet of Enid Blyton’s stories. Adventures, mysteries, boarding schools, pixies, gnomes, elves, wizards, talking toys, farms – she has covered a wide range of genres and ages when it comes to children’s books. I devoured them while growing up in India, often trying to draw parallels between my childhood and the one depicted in the books. As you must have guessed, it was not an easy task. She wrote about castle-like schools on the edge of the ocean, rocky bluffs, verdant greens, abandoned islands, sea-washed caves, horses, lacrosse, high-tea, and English manners. Most of her stories were set in the English countryside in the early 1900s. I was growing up in a city in India, in the eighties. Similarities were hard to come by. And maybe, that is what made her books more attractive to me. The schools in her books provided a wide range of extra-curricular activities. My school was focused on studies. So in order to be more like those freckle-nosed outdoor-loving English girls, I started playing tennis. It was the one sport that my family had in common with the books. Nobody played lacrosse in India. I don’t think they do even now. The moment I opened a book, I could go to a world, far far away. And when I wanted to come back to modern-day amenities and city life, it was all there. Waiting for me. But truth be told, the lives depicted in the stories, with their midnight feasts and laugh-out-loud classroom tricks often won. Her adventure stories had the kids getting up in the middle of the night, still in their pyjamas, with a dog at their heels, going out to explore some fishy going-ons. Throw in a smuggler, some hidden treasure, a secret cove, a hitherto-unknown passage in an old dilapidated building, and a bunch of curious kids and see the magic unfold.The kids always had enough scones and biscuits and ginger beer to see them through whatever mess they had found themselves in. They were smart and brave, and above all, honest. And in keeping with Blyton’s character trend, most of her characters, at least the good ones, loved the outdoors. They would go on camping trips, hike for days, go tobogganing in winter, and swimming in summer, all the while trying to stay out of trouble. But in vain. Whichever picturesque corner of England they chose to holiday in, trouble, or more aptly, adventure, would follow. Nothing really bad ever happened, and the good guys always won at the end. But in recent years, I have read critics who have pointed out (sometimes rightfully) that her stories were often not politically correct. It was the early 1900s for crying out loud. Things were different then. With that in mind, I have started reading her bedtime stories with my five year old. 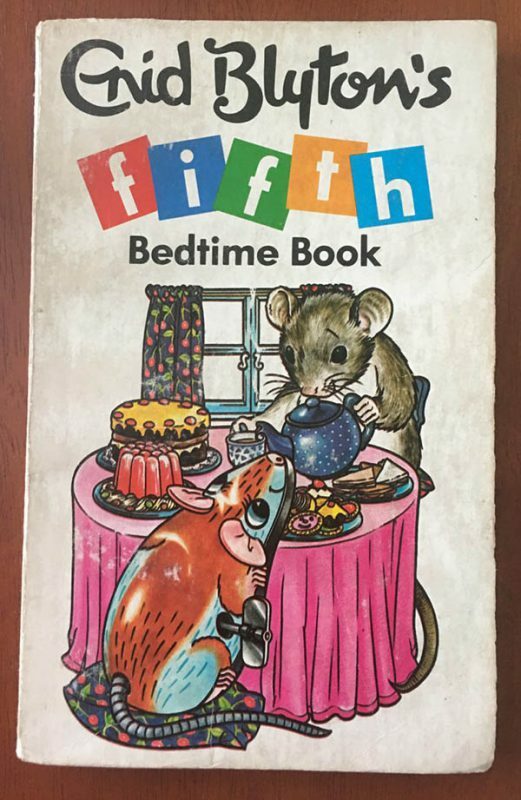 We began with Enid Blyton’s Fifth Bedtime Book, which I recollect to be perfect for his age. The story is called Sammy and the Spider. Later, Sammy comes across another huge spider and instead of killing it, he lets it climb on his cricket bat and ushers it out into the garden. After a few days, on a windy Saturday, his birthday money flies out of his open bedroom. After searching high and low for it, guess where he finds it? Yes, stuck on a huge web spun by the huge spider he had recently freed. Spiders are essential for the ecosystem. So this story teaches kids about caring for our environment. And, it teaches them to be kind. Kind in the face of the unfamiliar, the weird. These are the sort of kids who will go sit next to a child having lunch by themself. These are the sort of kids the world needs. And has always needed. Enid Blyton’s books aren’t so dated after all, are they? Beautifully said esha…sometimes I feel proud to njoy a little portion of ur friend ship….